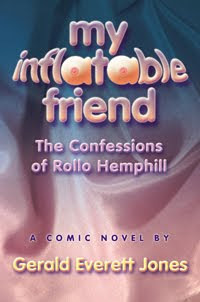 For a limited time, Rollo's first comic adventure, My Inflatable Friend, will be available as a free ebook download in EPUB, Sony Reader, and plain-text formats on SmashWords. List-price ebooks are still available for platforms Kindle, Ingram PDF (DRM), and Mobipocket. If you then yearn to read the sequel, Rubber Babes, you'll have to shell out $1.99, also at SmashWords. Like so many players in the 21st century publishing biz, I've been puzzling over what business models will emerge for ebooks. And while we're at it, we should figure out how people are going to pay (if modestly) for all kinds of creative content, including music and movies. I was really flummoxed by the article in the NY Times the other day about libraries doing online lending of ebooks. Almost certainly, the public should not have to pay to check a digital edition out of the local library database. But you'd think the library should either pay a somewhat higher "master-copy" fee or account for the rentals and pay a modest per-rental fee. That's pretty much what happens in the DVD rental market. Libraries loan DVDs, too, but not yet online, although that day is coming. Buying physical copies of CDs or DVDs simplifies per-use lending. But why on Earth would ebook readers have to "wait in line" for digital downloads? Yes, I understand why the publishers are pushing that, but it's a ridiculous imposition on the consumer. At this point, I believe that "free" is an essential part of any electronic publishing business model--at least for products that have not yet achieved the status of name brands and household words. That's frankly why Rollo is dropping his shorts and baring all--for nothing. In Hollywood, they call it "exposure work" for obvious reasons. Dan Brown doesn't have to give it away, ever. The rest of us will have to learn how to do "garage-band marketing" and sell out of our virtual trunks. Until we don't have to.